Given that it's a game featuring jetpacks, Mary Poppins umbrellas, and building tools that make The Sims look slow, it’s not entirely surprising that Fortnite has decided to do something a little different with its very first vehicles. In a new teaser for the game’s upcoming items, developer Epic Games let players in on the fact that it’s going to be adding shopping carts. Shopping carts that will let you “roll into battle alone or with a buddy”. Based on what’s said in the tease, it seems likely that these shopping carts will mark the introduction of actual ride-in vehicles to the game. It’s not the usual tank or 4x4 armored truck we’ve come to expect from games, but anyone who’s seen kids hanging around parks with shopping trolleys they’ve stolen from the nearest supermarket will know they can make a very good vehicle of war. At the moment it’s not entirely clear how the shopping trolleys will work in the game – for example how they’ll be found, or whether they’ll expire like the recently added jetpacks. 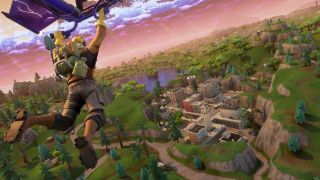 While Fortnite’s competitor, PUBG, arguably needs vehicles for traversal, Fortnite’s map is somewhat smaller, so to some this may seem like an unnecessary addition. However, we don’t think not needing something is likely to stop Epic Games from adding it. Vehicles, especially in the form of shopping carts, could add another fun and interesting element to the game. Build a ramp and use it to knock a group of enemies over like pins; get a speed advantage when running into, or away from, a fight. It could even be that Epic is preparing for some kind of racing element – there is, after all, a racing track on the east side of the game’s map. We don't know when exactly shopping carts will arrive in the game, but given they're being teased in the in-game 'new updates' section, it could be as soon as this week.